Hello. we’re Drs. Stephen and Kimberly Dankworth. Welcome to our Encinitas dental blog. Today’s topic is energy drinks and the damage they can cause to your teeth. We are seeing more and more Encinitas teens and adults with tooth enamel erosion caused by frequent consumption of sport drinks. Most of these Encinitas cosmetic dentistry patients take good care of their teeth, brush and flush, and come into La Costa Dental Excellence for a twice-yearly exam and deep cleaning. But guess what? If you drink energy drinks regularly, your enamel can erode even if you practice immaculate oral hygiene. Energy drinks like Red Bull, Rock Star, and Monster are a cocktail of powerful acids and other enamel-eroding substances. Most of them contain citric acid, fruit juices, loads of sugar, and a potent chemical that gives them their bright fluorescent color. 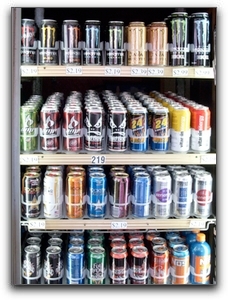 Perhaps you have often noticed young people walking out of Encinitas convenience stores swigging 32-ounce energy drinks. We are concerned that Encinitas teens do not understand the serious dental consequences of frequent acid baths. We need to add the caveat that soda and fruit juices also contain acids that can damage teeth. If your teeth have enamel erosion, whatever the cause, we can restore your smile with advanced cosmetic dentistry. Crowns, porcelain veneers, inlays and onlays can correct both structural and cosmetic problems. Our phone number is 760-633-3033. If you are interested in re-designing your smile, come in for an exam and consultation. With cutting-edge cosmetic dentistry, we can repair acid-damaged or stained teeth and dramatically increase your face value with simple procedure. I absolutely love La Costa Dental. I hadn’t been to the dentist in almost 8 years and my husband convinced me to make an appointment last year. I actually enjoy having my teeth cleaned now thanks to everyone in your office. I appreciate all the wonderful and caring care given to me from the receptionist to the dentist himself. This is a very personal professional group. La Costa Dental Excellence achieves their name – Excellence! You always exceed my expectations! My hygienist is fantastic!! Everyone has been wonderful. Dr Corrigan and Dr Dankworth are the best; I would not go anywhere else. If I ever move from San Diego I will still be a Patient of theirs. I can’t speak highly enough of them. If I have to fly or sail into San Diego, they are my dentists for life. Carlsbad dentists Drs. Stephen Dankworth and Kimberly Corrigan-Dankworth proudly offer sedation dentistry, restorative and cosmetic dentistry, dental implants, Invisalign clear braces, gum disease treatment and general dentistry to patients in the Carlsbad area including San Marcos, Encinitas, Leucadia, Rancho Santa Fe, and zip codes 92009, 92078, 92024.